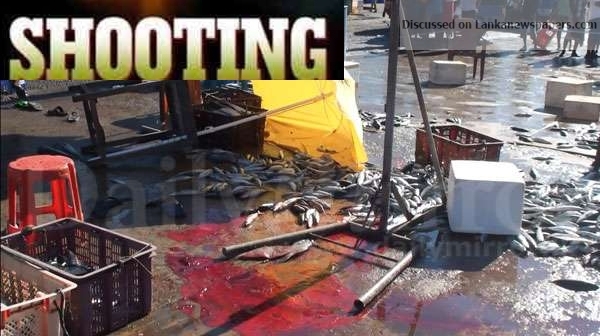 At least four people were killed and eight injured when two gunmen opened fire inside the Kudawella Fishery Harbour in Tangalle last morning, police spokesman Ruwan Gunasekera said today. SP Gunasekara said the two gunmen who arrived on a motorbike had opened fire at the victims while the injured were admitted to the Tangalle Base Hospital. Tangalle Police said the two gunmen had used a T-56 magazine and a pistol in the shooting. Three bodies were lying at the Tangalle Hospital and one at the Nakulugamuwa hospital, he said. Police said a man attached to the Parliament staff, who had come to buy fish, was also among the victims. Police suspects the shooting incident had occurred following a contract was given to some other party to take revenge following a dispute between two fisheries communities in the Fishery Harbour. IGP Pujith Jayasundara today ordered the Southern Province Senior DIG, Matara and Tangalle Divisional DIGs to conduct an immediate investigation of the incident and to arrest the main suspect and others involved in it. He also ordered to send a special police team headed by an Assistant Superintendent of Police (ASP) of the Colombo Crime Division (CCD) to Tangalle to assist in the investigations into the shooting incident, SP Gunasekara said. Eleven police teams were deployed to carry out investigations including the scrutiny of CCTV footage and telephone tower records.